A while back, I was once signed up for email alerts via Weather Channel. However, since closing that particular email address, I obviously no longer get severe weather alerts on my phone. I would rather receive weather alerts either from NOAA or Weather Channel via text message anyway (I feel I would be alerted more quickly that way), however I cannot find a place on their site to actually input my phone number to receive severe weather alerts. Can some please provide a direct link(s) where I can sign up for severe weather alerts via TEXT Message? I would appreciate it. NOAA offers such a service for emergency personnel last I knew. It's called iNWS. I was reading around the NOAA weather website and I stumbled upon this site (https://www.weather.gov/subscribe) that says that NOAA doesn't send out text messages, I looked it up for the weather channel, but all I found was this (https://feedback.weather.com/custom.../2384024-how-do-i-sign-up-for-weather-alerts-) I don't think they send SMS or normal text messages. A question for you is, what kind of phone is it? Is it Apple or Android? If you have an iPhone this might help (https://www.weather.gov/wrn/wea) as cellular companies send out alerts like the example in the link from NOAA to your phone. Hope this helped! Ok, I guess I'll have to go back and re-register for the site. If I recall, you're required to send in credentials proving that you're in an eligible group. I use this service. Usually get a text just before or as the weather radio goes off.. 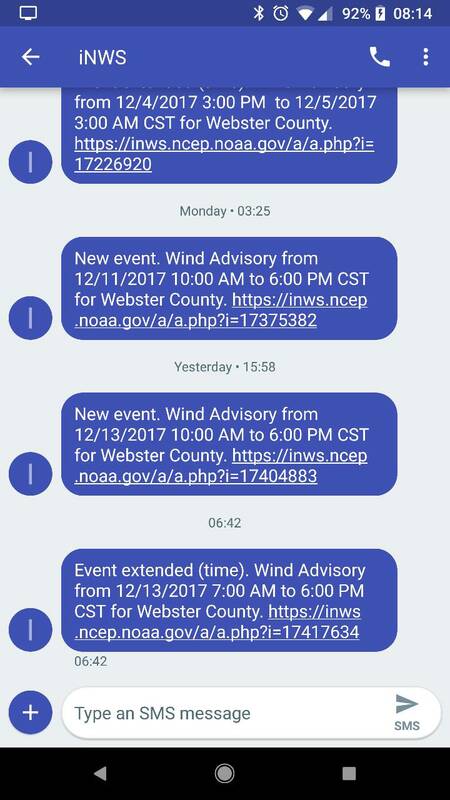 Check with your local media (television and radio)...... my wife gets FREE weather text messages from a local television station...she simply went to their website and signed up to be notified via text on weather conditions, statements, watch's and warnings. There are also some radio stations locally (both A.M and F.M) that offer the same type of messaging. There is a chance that it may be al la carte were you can pick and choose what you want to be notified about. This tread started at a good time, as I am hearing the FCC just approved a FEMA and Weather emergency alert system for your phone called "Blue Alerts" or something close to that. Hopefully it will be released to the public quickly. Blue Alerts are for Law Enforcement officers right now, but may spread to the general public. I currently use iNWS and have not had any issues with that service. Years ago when INWS was open to the public, I signed up for it. Have been using it for multiple areas of the US for years and have never had any issues nor down times. It is now closed to the public. "iNWS is intended for members of community emergency planning and response management"
Can anyone sign up for this service? What kinds of "groups" are eligible? Emergency response personnel, and emergency Management personnel. It may not be available in your area but if it isn't they should be able to steer you in the right direction. Hopefully. Many local TV news stations have a weather APP you can download free, in that APP, you can sign up for their alerts.